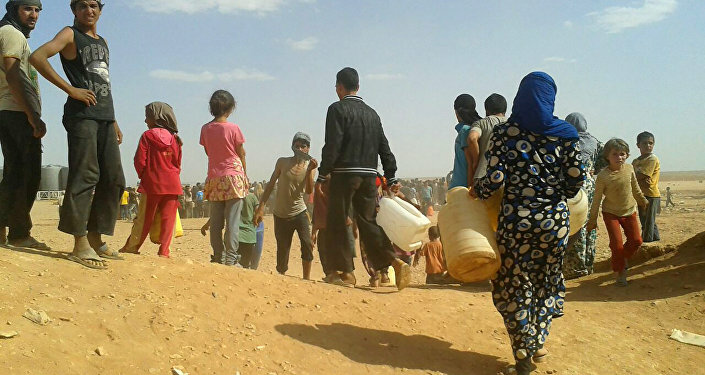 The humanitarian situation in Syria's At Tanf is extremely difficult, as refugees in the neighboring Rukban camp cannot get access to humanitarian and medical aid due to the US' actions, according to the Russian military. The US has banned anyone from coming within 55 kilometers of its military base in At Tanf, Syria, on the nation's border with Iraq, depriving more than 50,000 refugees in the Rukban camp, which is located in close proximity to the base, from getting humanitarian assistance, Head of the Russian center for Syrian reconciliation Sergei Kuralenko said during a news briefing. Kuralenko added that "despite the consultations held earlier, the American side has still not provided access to the Rukban camp for humanitarian agencies." Earlier the US expressed its willingness to allow humanitarian assistance deliveries but noted that it was the Syrian government who had impeded these efforts. In the beginning of November, Russia accused the US of establishing a training camp near Rukban to forge a new moderate opposition, calling US actions "a war crime," since they prevented the Syrian government from setting up a safe corridor for deliveries of humanitarian supplies for refugees. However, Operation Inherent Resolve spokesman Col. Ryan Dillon refuted the accusation as "false" and "baseless," assuring that the coalition's partner force allowed deliveries to pass. The Russian Defense Ministry has repeatedly warned that refugees living in the Rukban camp were being used as a "human shield" for the US military base near At Tanf. The base has twice been used to strike Syrian government-aligned forces fighting Daesh militants. The military base, which was established without the government's permission by the US in April 2017 near the town of At Tanf on the Syria-Iraq border, has become a problem for Syrian forces fighting the Daesh terrorist group. The United States justified the setting up of a military base there in terms of the need to carry out operations against Daesh. However, since the establishment of the base, there have been no reports of American anti-terrorist operations, according to the Russian Defense Ministry. The Russian center for reconciliation also proposed to introduce a two-day silence regime on November 28 in the Eastern Ghouta de-escalation zone to ease tensions in the western part of the zone. "In light of the provocative actions of the Ahrar al-Sham and Jabhat al-Nusra factions, the situation in the Harasta area, in the western part of the de-escalation zone No. 3, Eastern Ghouta, continues to be tense," the center said. "In order to prevent any violations of the cessation of hostilities, the Center calls on all conflicting parties to introduce a "silence regime" in de-escalation zone No. 3 in Eastern Ghouta on November 28 and 29," the statement said.